Bears Set to Take on No. 22 Kansas State in Season Opener! Can you believe it? 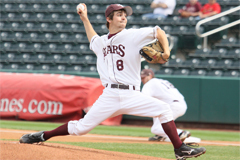 The bears are heading up to Manhattan this weekend to take on the famous Kansas State Wildcats for the third time. It’s a very big game and what a way to start things off! Go Bears! Have strength guys, play hard and represent Missouri State University well! This was quite a victor for the Bears as all three goals were scored in the first half of the games. Way to go guys! Keep it up! It’s going to be a great season for the Bears! The Bears Volleyball team will be facing off against numerous opponents this Labor Day weekend at home so please make sure to attend and root them on to victory! Hope everyone enjoyed their long weekend for President’s Day. Even with the short week there is still plenty of great events going on around campus. Resume Madness continues from 10 AM – 1 PM & 2 PM – 4 PM outside Glass Hall room 103 and in the First Floor Atrium of Strong Hall. Usually we save the sports events for later in the post, but this Wednesday is the final Men’s Basketball regular season home game. 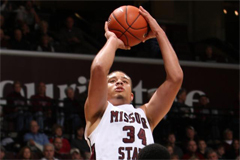 Come out and support the Bears seniors as they take on Indiana State at 7:05 PM at JQH Arena. The SAC Weekly Film of the week is The Twilight Saga: Breaking Dawn Part 1. The film will play at 9 PM on Wednesday and Sunday in the PSU Theater. Free for students. Check out our preview. Lee Mun Wah: An Unfinished Conversation events will take place throughout the day beginning with the Keynote: “What Stands Between Us” at 8 AM in the PSU Theater, followed by Student Dialogue Groups: “A Cross Gender/Race Conversation” at 9 AM in PSU West Ballroom, and culminating in the Film Showing & Discussion: “Last Chance for Eden” at 6:30 PM at Lay Hall Auditorium on the Drury University Campus. SAC After Hours will be hosting Concert and Karaoke from 9 PM – 12 AM in the PSU Food Court. Local band Modern Epic will perform and after their performance there will be karaoke. The second event in the MSU Master Filmmaker Series – Benoit Pilon will takes place in the PSU Theater from 7 – 9:30 PM with a screening of The Necessities of Life. SAC PResents Rock ‘N Bowl from 7:30 – 10:30 PM offering free games in the Level 1 Game Center. 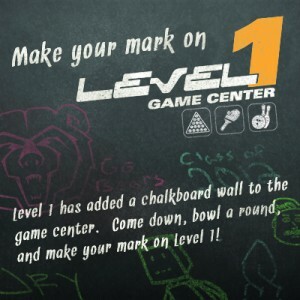 It would be a great time to bowl some free games and check out the brand new chalk wall and make your mark on Level 1. Catch the SAC Weekly Film if you missed it Wednesday. Monday is unusually quiet next week. SAC Presents: Miss America Debbye Turner in the PSU Theater from 11:45 AM – 12:45 PM. Debbye Turner will speak about the struggles she overcame to become Miss America and her life since. Join Outdoor Adventures for an all-day CAVING TRIP Saturday, March 3rd! The $15 trip fee includes everything you’ll need- transportation, headlamp, guides, gloves, and a helmet. A free clinic for anyone interested is recommended on February 29th (register online by 2/28). Registration for the trip ends Thursday, March 1st. Hope to see you there! How to Save a Life: Campus Recreation offers several opportunities for CPR/First Aid Certification. Thursday, March 8th at 1:30pm is your next chance. For more information, check online and register by March 2nd! If you missed the first one, the Racquetball 2 Tournament is your chance to show off your skills. Registration ends THIS FRIDAY, so sign up soon! Flag Football (4-on-4) & Softball Leagues are taking sign-ups now. Get your dream team together or register as a free agent. Both leagues begin March 5th and registration ends THIS FRIDAY as well. Hoops! The Campus Rec Wellness program is offering a Sunday Hooping class beginning March 4th. The $30 fee includes 5 classes and registration ends next Thursday, March 1st. 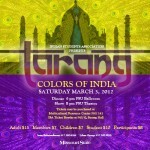 Tickets for Tarang 2012 are on sale at the following campus locations: The Multicultural Resource Center in PSU 141 (8 AM – 4 PM) and the ISA ticket booths on the second floor of hte PSU & Strong Hall. Get your STAR Awards applications in by March 1st! Tell Us About Your MSU Experience – MSU wants to improve the student experience, and you can help. Beginning February 14, a group of selected freshmen and seniors will receive an e-mail inviting them to complete the National Survey of Student Engagement (NSSE). 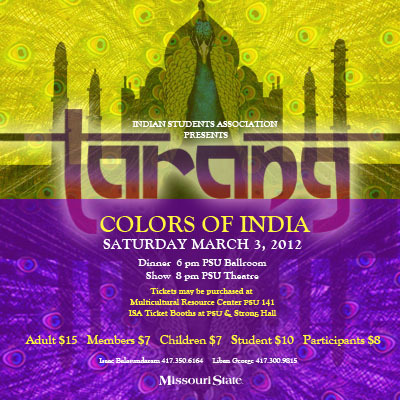 For more information contact KellyCara@missouristate.edu. Graduate Recruitment Weekend 2012 – Learn about the SAHE master’s program and interview for graduate assistantships on March 8-10. More information available on the website or Facebook. Deadline for graduate assistantship interviews is February 18. 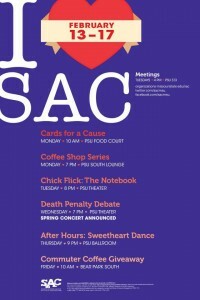 I heart SAC Week and much more! It’s I Heart SAC Week here in the Union. Make sure to stop by for all the great events and be on the lookout for an exciting SAC announcement on Wednesday! We’ve also got tons of athletics this week with baseball and softball starting up. So let’s not waste anytime getting into all of the great events! The Career Center will be holding career panels for Non-Profit Professionals (10 AM) and Science Professionals (1 PM) in PSU 313. Learn what it’s like to work in either field. The Office of Student Engagement will be holding Student Safe Zone training from 4 – 7 PM in PSU 308BC. This program will train undergraduate students to be Safe Zone Allies. Wednesday night SAC Presents: Death Penalty Debate. From 7 – 8:30 PM experts Jeff Jacoby and Bud Welch will be debating the death penalty in the PSU Theater. 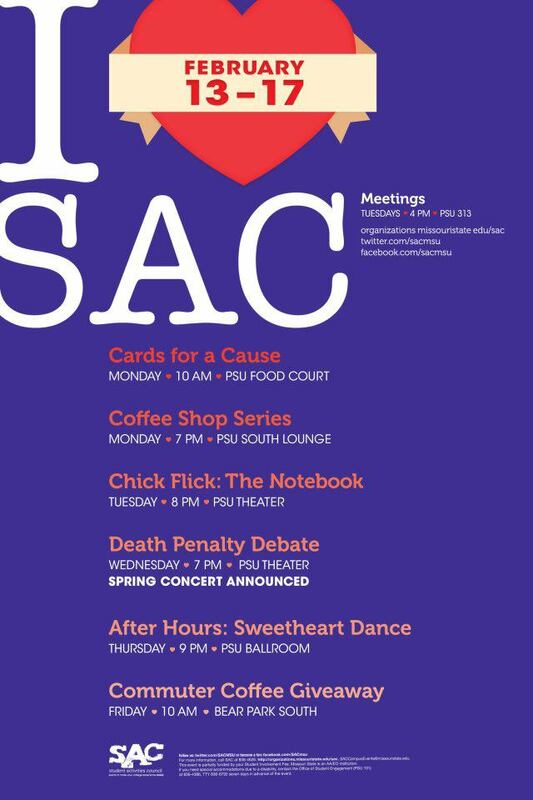 SAC After Hours will be hosting the Sweetheart Dance at 9 PM in the PSU Ballroom as part of I Heart SAC Week. At 10 AM SAC will be giving away free coffee and hot chocolate at Bear Park South while supplies last at the Commuter Coffee Giveaway. President’s Day! That means no classes and offices are closed. Resume Madness will be taking place from 10 AM – 4 PM across campus in Glass Hall outside room 103, Strong Hall Atrium, and Professional Building 4th floor. Bring your resume and have it critiqued. SAC Presents: Quite Tickled Tuesday from 7 – 9 PM. This is your chance to test out your comedy chops in the PSU South Lounge. Table Tennis Tournament registration for singles and doubles ends Friday! $5 per individual or $7 per team. Register. 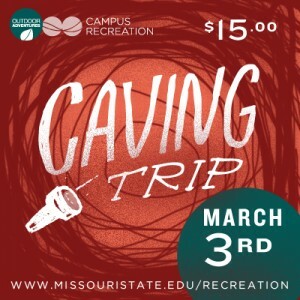 Join Outdoor Adventures for a Caving Trip! The $15 fee includes transportation, headlamp, guides, gloves, and a helmet. The trip is all day on Saturday, March 3. A FREE clinic held on 2/29 is recommended for anyone interested. Register today! Several opportunities for CPR, First Aid, and Wilderness First Aid certifications are available through our department. These certifications can be a great addition to your resumes for several types of jobs. Details online! 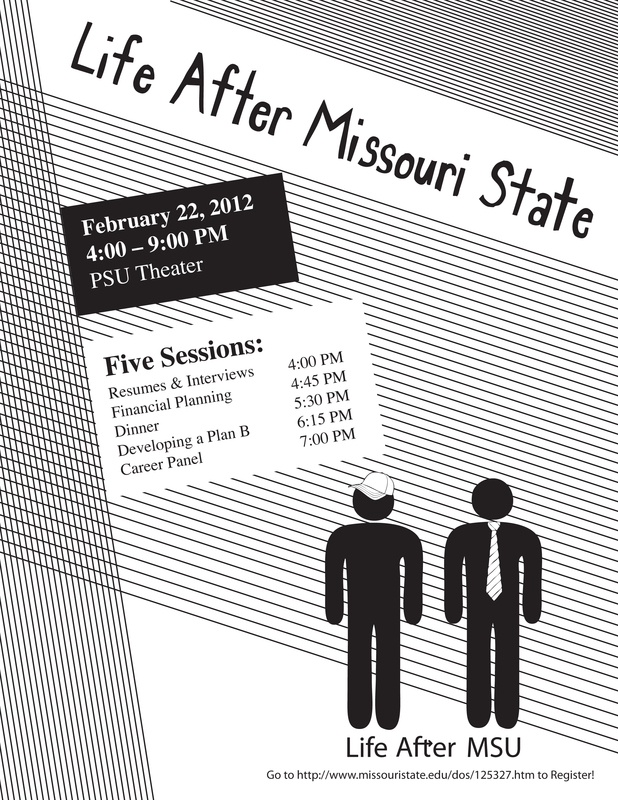 Life After Missouri State – February 22nd 4-9pm in the Plaster Student Union Theater. Attend 5 sessions focused on success after graduation! Register online at or visit the Facebook page for more information. The Office of Student Engagement is sponsoring two Alternative Spring Break Trips that will provide 10-15 students per trip to travel to a major US city, learn about a specific social issue, and provide meaningful service to the community. More information available at the Volunteer Programs website. Stay up to date with local service opportunities in the community and through the Center for Leadership & Volunteerism – To receive the biweekly newsletter simply send an e-mail to volunteer@missouristate.edu expressing your interest. The Community Blood Center of the Ozarks blood drive continues Wednesday and Thursday from 10 AM – 6 PM this week. Come by and share some of your blood, you’ve got plenty. Level 1 Chalking Wall is now open! If you haven’t been down to Level 1 in awhile you may want to check it out now as they’ve added a chalking wall. So come by, bowl a little, grab a snack, play some Wii and then make your mark on Level 1. Sit in on a discussion regarding the challenges facing both LGBT and African American communities in affirming one another. The event, LGBT and African American Communities Forum – Part II, runs from 6 – 7 PM in PSU Room 315. Students for a Sustainable Future is kicking off our Beyond Coal campaign, a nationwide movement to transition from dirty coal power to cleaner, renewable energy! Special guest speakers for the event include Dan Chiles and Lindsey Berger. The event runs from 6 – 8 PM in the PSU Theater. Catch the SAC Weekly Film: For Colored Girls. The film is adapted from an award winning play and directed by Tyler Perry. See it at 9 PM in the PSU Theater. Check out our preview. SAC After Hours Presents: DVD Bingo this Thursday from 9 PM – midnight in the PSU Food Court. Come play bingo for chances to win a DVD! It’s the deadline for entering the Weight Lifting Tournament. 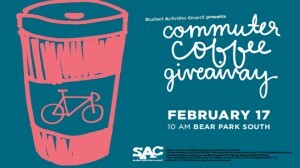 If you’re interested in signing up visit http://www.missouristate.edu/recreation. Theatre and Dance Department is sponsoring a theatrical production of the play “For Colored Girls Who Have Considered Suicide…When the Rainbow is Enuf”. The how starts at 7:30 PM in the PSU Theater and tickets are required. MSU students are free but advanced ticket is required. Other students/seniors $12. Adults $14. It’s Friday! So you know what that means. SAC Presents: Rock ‘N Bowl. Come play free bowling, pool, ping-pong, and Wii in the Level 1 Game Center. The event runs from 7:30 – 10:30 PM. If you missed “For Colored Girls Who Have Considered Suicide…When the Rainbow is Enuf” on Friday catch it again on Saturday at 2:30 PM and 7:30 PM in the PSU Theater. Last chance for “For Colored Girls Who Have Considered Suicide…When the Rainbow is Enuf” at 2:30 PM or to catch the film version at 9 PM. Both events take place in the PSU Theater. Kick of I Heart SAC Week with Cards for a Cause. Stop by and make a card for someone you heart in the PSU from 10 AM – 12 PM. Coffee Shop Series #1 continues I Heart SAC Week with the first of 3 Coffeeshop Series Performers. This event will feature music by Poema and Jake Germany. Free coffee and snacks provided to the first 50 audience members. The event runs from 7 – 9 PM in the PSU South Lounge. 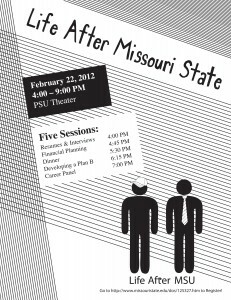 Catch a screening of “We Were Here” in the PSU Theater from 7 – 9 PM. Please join us for a special Valentine’s Day green lunch and show your love for sustainability. 12 – 1 PM in PSU Room 315BC. Come by PSU 315 A from 12:30 – 1:30 PM for Study Away 101 and get some information on the study away program. This is a casual, drop-in event. Student Government Association will be holding a meeting in PSU 313 from 5:30 – 7 PM. The Trip to Dr. MLK Monument: Discussion and Planning Meetings gives you an opportunity to provide input and gather information on plans for an educational and entertaining trip to the MLK Monument in Washington, DC during Fall 2012. PSU 315 C from 6 – 7 PM. Tuesday’s I Heart SAC Week event is a Chick Flick. SAC will be watching “The Notebook” and giving the first 200 audience members FREE Chick-Fil-A sandwiches. 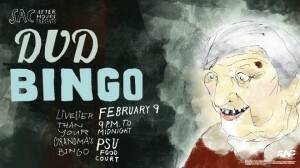 PSU Theater from 8 – 10 PM. Interested in going to graduate school? Want to work in student affairs? The Graduate Recruitment Weekend (GRW) is just for you! The Student Affairs in Higher Education Master’s program is hosting its annual GRW March 8-10, 2012! The annual GRW is a weekend planned to introduce prospective students to both the Student Affairs in Higher Education Master’s program and the university. The event includes interviews for graduate assistantships and social events to meet other potential students. For more information about applying to the program or registering for the GRW you can visit http://education.missouristate.edu/StudentAffairs or our Facebook page https://www.facebook.com/SAHEMSU Deadline for graduate assistantship interviews is February 18. MSU wants to improve the student experience, and you can help. Beginning February 14, a group of selected freshmen and seniors will receive an e-mail inviting them to complete the National Survey of Student Engagement (NSSE). The survey will help us understand how students are spending time in and out of the classroom, which will guide decisions that benefit MSU students. If you are selected to participate, please tell us about your MSU experience by completing this online survey! Your responses will provide information that cannot be found anywhere else. For more information contact Kelly Cara, Assessment Research Coordinator at 836-3064 or KellyCara@missouristate.edu. If you’d like to help Friends Against Hunger on February 11th from 12 – 2 PM, make sure you fill out an application at the Office of Student Engagement (PSU 101) by Thursday, February 9th at 4 PM. Contact Tim Sirkoi Timothy817@live.missouristate.edu with questions.